SONAX Wheel Cleaner Full Effect 16.9 oz. Buy Five Get One Free Special! Home > Shop By Brand > SONAX Car Care > SONAX Wheel Cleaner Full Effect 16.9 oz. Buy Five Get One Free Special! For a limited time purchase a five-pack of Sonax Wheel Cleaner Full Effect and receive one extra bottle - FREE! That's a value of $15.99! Safe on all wheels, including aluminum and alloys! SONAX Wheel Cleaner safely and effectively eliminates the most stubborn dirt such as brake dust, oil and rubber residue. Color-change foam lets you know it's working! 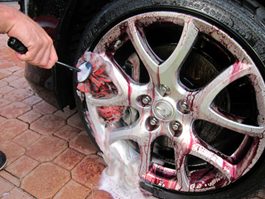 SONAX Wheel Cleaner's acid-free, non-corrosive formula is safe on all types of painted, alloy, anodized, clear coated, chrome, aluminum and stainless steel wheels. Clean with confidence! 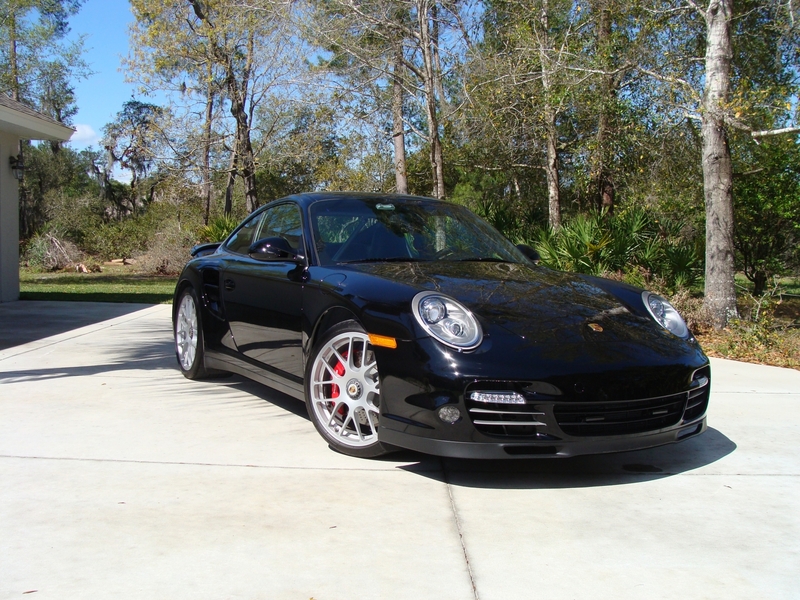 If you have custom, specialty, or otherwise expensive wheels, you have just found your wheel cleaner. 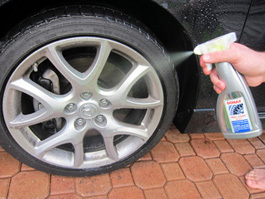 SONAX Wheel Cleaner is pH neutral to protect your wheels' finish. This is in sharp contrast to many wheel cleaners, which contain harsh chemical solvents. SONAX Wheel Cleaner is tough on dirt, but gentle on your vehicle’s wheels. Gentle does not mean weak! Instead of acidic cleaners, SONAX Wheel Cleaner is formulated with more sophisticated ingredients designed to attack what is on the wheel, not the wheel itself. You can literally see SONAX Wheel Cleaner working! 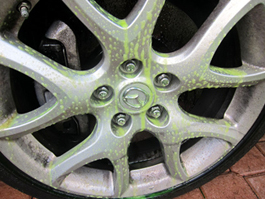 SONAX Wheel Cleaner sprays on fluorescent green and turns red as it penetrates dirt and grime. Red indicates that the brake dust, oily film, and dirt are being loosened and - with minimal effort - they'll rinse away, leaving clean, sparkling wheels. 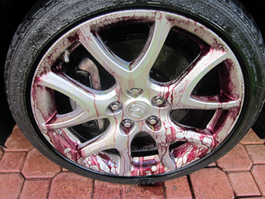 Spray on SONAX Wheel Cleaner and allow it to dwell for several seconds as the cleaner turns red. If necessary, use a soft-bristled wheel brush to clean between spokes. The Speed Master Wheel Brush has soft nylon bristles that are gentle on all wheels, and it cleans deep between spokes. Rinse with clean water and towel dry to prevent water spots. Spray one wheel at a time with SONAX Wheel Cleaner. 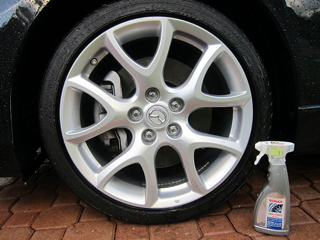 SONAX Wheel Cleaner immediately starts loosening brake dust and oil. 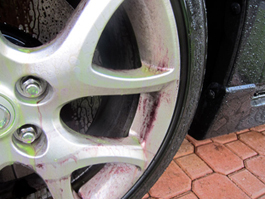 Above, you can see that SONAX Wheel Cleaner turns red as it comes into contact with brake dust. 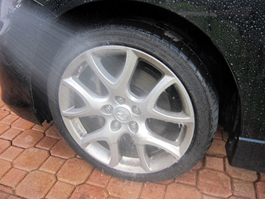 SONAX Wheel Cleaner does most of the work for you! Use a soft wheel brush to agitate the cleaner. Here we used a Speed Master Wheel Brush. Those of us with expensive, custom wheels or unique finishes have struggled to find a safe wheel cleaner. Search no more! SONAX Wheel Cleaner is the solution! This product does what it says......removes brake dust, metal dust, etc. Spray it on, hose if off, hit it with a tire/wheel brush. Have used this for several years because it does a pretty decent job. Audi S4 with brakes that are quite dusty. Have to clean every week or two and the Sonax makes the job quicker and easier. Like to buy six at a time on sale to make it feel a little better, but overall, the product works well. ConsNone. Just don?t let it dry on you?re driveway as it will temporarily stain. One of the best wheel cleaners I have found for my various German wheels. Easy on all surfaces and cleans very well. I like the color change when it eats the brake dust. Spray on, wait, agitate, rinse, dry = clean. haven't tried many other cleaners, but this one works well. it does have a strong smell, but it works! One of the best cleaners I ever used.